Not just for music or movies anymore! 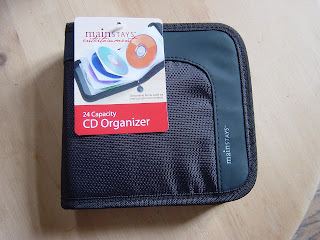 I purchased this cd organizer at Walmart in the clearance rack for $2.00. It measures about 6" square and has 12 double side pages to hold 24 Cds. Music Cds and movie DVDs...not for quilters. 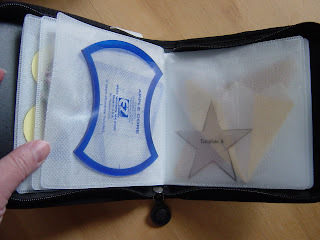 I use mine to hold all my templates and applique patterns. You can purchase these in different sizes. They come in larger booklets with pages that have 8 slots per page. 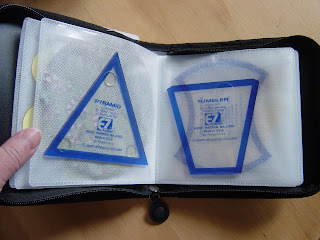 They also come in a little duffle bag style where the cd holders are standing up and you can just flip through them. The style all depends on how many templates or patterns you have. I don't do much applique work, but I just love all the beautiful pieces, like Tisket-A-Tasket blocks, that I have seen on so many wonderful blogs. When you cut out all the template pieces, you can place all the patterns from one design into one sleeve of your cd holder and write a label for what the pattern is or what magazine it came from. One small cd holder case can hold all the BOM patterns for one quilt...keeping them all together and organized. The smaller holders are also great to take with you on a retreat or to your guild meetings if you are planning on doing a little project. The case is small enough to carry anywhere and protects everything in the zippered case. Below are a few pictures of my case...I'm thinking I have to upgrade to another one, because I only have 2 empty pages left! Hope you enjoyed this quick TTT. We're finally back to normal here, I think. Just need to put the suit cases back in the attic. For next week's TTT, I'm digging into my Home Depot bag again...so don't forget to check back in. yes,yes,I have this and I use it for templates from today!! Welcome back...and back I go to Walmart for another great idea!!! Terrific idea, I can see many possibilities. What a great idea!!! 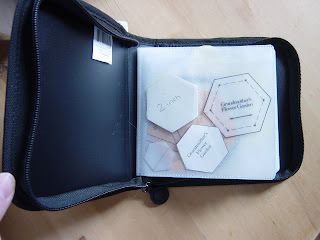 The cd case would be a great organizer for templates! Awesome idea! I now have a use for that case since I switched all my music to my ipod! Great idea and just think how many of those we can keep out of the landfill if we recycle - I know I have a few of these stored somewhere in this house! Now I have a good use for them. Thanks! I have a CD case and never use it. Time to take it to the sewing room. Great idea Karen. 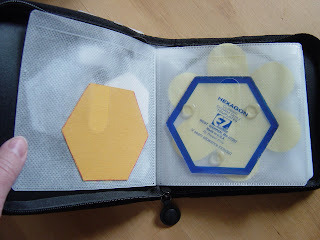 Wow...I love the way you think outside the box and I absolutely love the way that CD case can hold so much--amazing. The size is just perfect for so many things! I'm thinking I might even be able to use it for something in my organization of school! Thank you so much! What a great and practical ideas! Especially for templates, always handy! Thanks! As someone I love used to say, "You're a genie!" (meaning genious). What a cool idea! Thanks. What a neat idea. Thanks for sharing and have a great day! I just came over from Suzie and had to read all your TTTs! Excellent ideas. The scissors with the blades upwards in the cup holder looked dangerous, but they are wonderfur scissors. You are amazing. I shared your blog with a friend and she agrees with me. Yes, we are close to each other. If you are coming to the Cape let me know and I will treat you to lunch. Karen, I hope that you are getting enough sleep...You must stay awake at night coming up with these GREAT ideas. This one I LOVE! Who would have thought?! O.K. Karen...let's see if this works! I think I fixed it! Let me know! Thank you so much for your help! I'm amazed by all the ideas you have for stuff:o) Thanks for sharing!